Announce your vintage wedding with the style it deserves with our vintage wedding range. 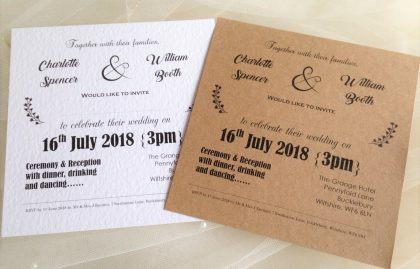 Our vintage wedding stationery is all printed on the same attractive brown flecked kraft card with a rough natural feel. Our kraft card is 280gsm in weight, is eco friendly and 100% recycled. 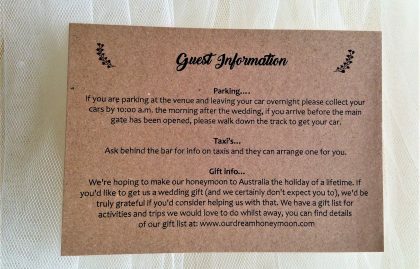 This style of wedding stationery is right on trend and the growing popularity of vintage themed weddings and it is also popular for other wedding themes. Woodland Weddings, Rustic Weddings, Autumn and Country themed weddings. Creative Tip! 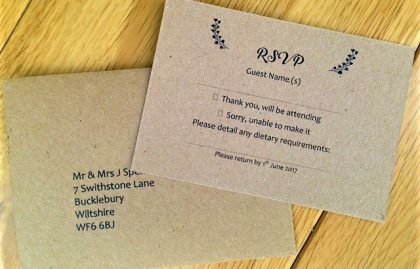 Why not buy the matching RSVP card and guest information card and tie all three items together with some twine to make a bundle!